Wanted: dairy farmers with really small hands. Guy attacks Brit Hume in a three-word Tweet, gets two-thirds of it wrong. "You can't say that, comrade." Via Powerline's "The Week in Pictures"
I found this video quite hilarious. It pokes some fun at a computer game called, Mount and Blade: Warband. Absolutely loved the Millenial vs Boomer. It reminds me of some of the conversations I've had with various members of my family. 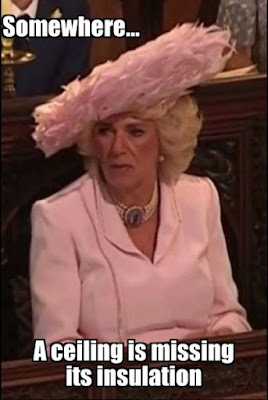 Also, give old Camilla a break. In Soviet Socialist Britain, women are going to have to use whatever they can get for their ridiculous hats. Although, I'm not sure how effective this method would be, for a grandpa that can't outrun his 6 yo granddaughter. Better hope the bad guy is on crutches! That's one reason I was in a concealed carry class today. Yeah, you could recreate the scene in Indiana Jones where the crowd parts, and the bad guy waving a scimitar advances toward Indy...who shakes his head and calmly pulls out his revolver and shoots the guy. One of my ROTC instructors, MSG "Blackie" (an SF soldier, and a survivor of multiple tours in 'Nam), noted that the best defense against a knife attack was 3 pounds of pressure (on a trigger). Blackie had a point about that. Susan Rice: Where did I go wrong? Yeah, what's up with that? Have we reached peak Trump Derangement Syndrome? Yeah, but what a way to go! So, do they think they got a bargain? Who am I to buck science and experience?